Speaking of the enemy’s attempt to have lies and ignorance lead to a lack of correct understanding about the Bible, there are two parts of this story which have not been covered yet, despite all appearance to the contrary. 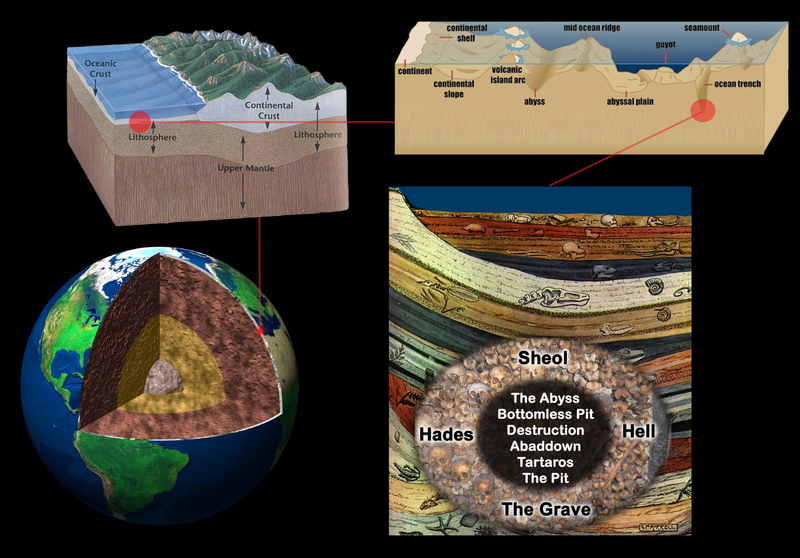 That would be the very beginning with the temptation in Eden, and the very end in the lake of fire. It would be negligent to not cover these matters, in doing a thorough scriptural analysis of Satan, so I am including them, despite that as controversial as they are, it could make this entirely unpalatable to most of Christianity. But I am here to tell you the truth, about what the Bible teaches, not to hold back information because it is unacceptable to many Christians. The word here for “soul” is “psyche” and it means “life” and “soul”. It is also used in Matt 10:28 “And fear not them which kill the body, but are not able to kill the soul: but rather fear him which is able to destroy both soul and body in hell.” But there is a different word that is used in 1 Cor 15 for “spirit”, and that is “pneuma”. The soul and the spirit of a human are different. Heb 4:12, For the word of God [is] quick, and powerful, and sharper than any two-edged sword, piercing even to the dividing asunder of soul and spirit, and of the joints and marrow, and [is] a discerner of the thoughts and intents of the heart. The “spirit” is the “breathe of life” mentioned in Gen 2:7 which is the “spirit” which gives life. Job also records that it is the spirit, or breath of God, which gives us life. So for each of us, we cannot become a living soul until the breath of life, the spirit of God, is added to our body. Originally, God breathed a spirit into Adam’s body, and he became a living soul. Did God do the same with Eve, and breathe a spirit into her? No, such is not recorded. Nor is it recorded that God gives a spirit to each child at conception – yet we know each child, every person, is a living soul, so a spirit must have been added to the body at some point. A large emphasis of this new research if the assertion that a piece of the spirit that God breathed into Adam was multiplied, becoming Eve’s spirit, at the same time that God multiplied a piece of Adam’s body, his rib, and this became Eve’s body. Comparing the verses in Job with Lev 17, and Gen 6:3, it becomes clear that the spirit is what gives life, and that the life of the body is in the blood, so this mean that the spirit we have that gives life, is connected to the blood, in the blood, somehow. And this is the breath of God. And so when God made Eve out of Adam’s rib, the rib contained blood (ribs contain blood). 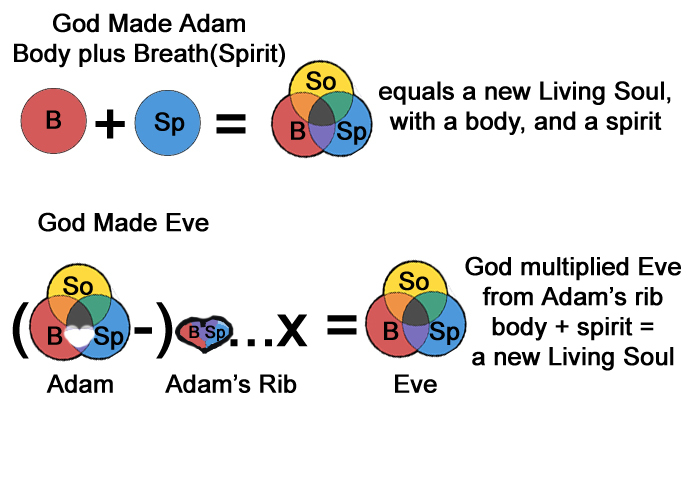 Which according to the Bible, this means that some of Adam’s spirit, the breath of life breathed into him by God, was in the rib that God used to multiply Eve from Adam. Not just the body, but the spirit given to Adam by God, was multiplied, and 1 became 2. One body became two, one spirit became 2, and because of this, one living soul became two living souls. When it comes to children, the Bible indicates that the same multiplication process happens, but with children, two become one (usually). We know from genetics that both the body of the mother and father are combined to become the body of the child. However, when it comes to the breath of life, the spirit, that makes a body become a living soul, the Bible clearly indicates that the spirit of the child, giving life, is multiplied solely from the spirit of the father of the child. This is actually sort of balanced, as it is the mother’s body that does all the multiplication of the body of the child throughout pregnancy. Here the bible confirms that multiplication for all humanity was like that of Eve being multiplied from Adam. It also teaches that children come from their father, but through their mother. A child is a living soul, whose life itself, the spirit giving life, comes from the father, but the child is multiplied through the mother, to have a body. But the life itself, the spirit, is multiplied solely from the father of the child. Without the spirit, the child would not be a living soul. This is likely why the Bible seems to always refer to fathers begetting their children, as the life comes from the father. Another confirmation that the spirit of the father of the child is multiplied into the spirit of the child may be seen in Malachi. Adam is referred to as having the “residue of the spirit”, not Eve. So looking at Adam and Eve, how did multiplication work when they had children? The bible makes clear that the sinful spiritual nature resulting in death passed to all their children from Adam. 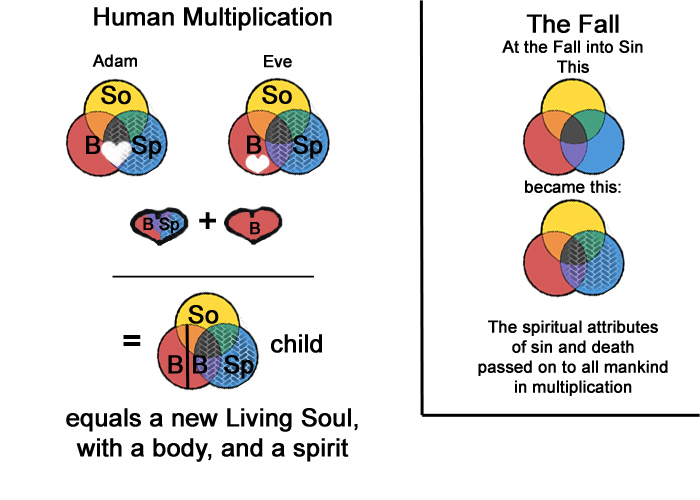 This makes a clear case that all inherited spiritual death and sinfulness came from Adam, which makes sense if his spirit alone was multiplied and passed on to all their children. 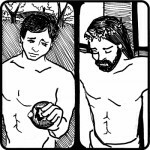 Romans 5 “Therefore, just as through one man sin entered into the world, and death through sin, and so death spread to all men, because all sinned– for until the Law sin was in the world, but sin is not imputed when there is no law. Nevertheless death reigned from Adam until Moses, even over those who had not sinned in the likeness of the offense of Adam, who is a type of Him who was to come. But the free gift is not like the transgression. For if by the transgression of the one the many died, much more did the grace of God and the gift by the grace of the one Man, Jesus Christ, abound to the many. The gift is not like that which came through the one who sinned; for on the one hand the judgment arose from one transgression resulting in condemnation, but on the other hand the free gift arose from many transgressions resulting in justification. For if by the transgression of the one, death reigned through the one, much more those who receive the abundance of grace and of the gift of righteousness will reign in life through the One, Jesus Christ. So then as through one transgression there resulted condemnation to all men, even so through one act of righteousness there resulted justification of life to all men. For as through the one man’s disobedience the many were made sinners, even so through the obedience of the One the many will be made righteous. The Law came in so that the transgression would increase; but where sin increased, grace abounded all the more, so that, as sin reigned in death, even so grace would reign through righteousness to eternal life through Jesus Christ our Lord. That the sinful nature passed through the spirit of Adam as it was multiplied to all his children, makes clear that it is not only the spirit, but its attributes, such as sinfulness or mortality, which pass onto the child. The same may be seen in Ex, with the sins of the fathers alone being said to pass to the children, but as the Lord is said to do this visiting, it is uncertain. There is contrast to the sins of the mother, which the Bible implies are normally blotted out. 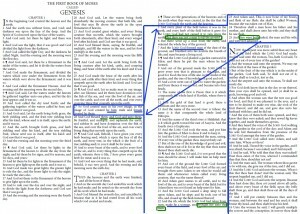 And again, Job seems to confirm that the breath of God gave him life, and it seems to make the most sense that Job was referring to himself also having the breath of life that God had once breathed into Adam, the same spirit, but that had been multiplied down through the generations to be Job’s also. Thus, we all have the same spirit, breath of life, that God once breathed into Adam, and the sinful nature of spiritual death that Adam later acquired. Besides normal human multiplication, there is another example which confirms this. Jesus Christ is the only begotten son of God, and this is the same word “begat” that is used of human men begetting children. Jesus Christ was conceived by the Holy Spirit, who is also God, which parallels that the breath of life comes from the spirit. And Jesus Christ spiritually is God and sinless, sharing in the spiritual attributes of God the Father. But, Jesus Christ is also eternal, and God, and himself being the fullness of the Godhead bodily. The Bible teaches he was both fully man and fully God. But Jesus Christ was also the son of Mary, a human woman, and Jesus Christ was also a human man. When it comes to the body of Jesus Christ…God the Father is spirit, and the Holy Spirit is spirit. As God the Father is a spirit, He does not have a body made of flesh and bones, by which Jesus could be half-God physically in His body. In fact Jesus Christ is the “image of the invisible God” (Col 1:15). And so it can be argued Jesus Christ is the only person of God with a physical body. Being eternal, Jesus is who He is in his body and always has been. Jesus Christ is God, and came from above, existing eternally, creating all things (Jn 8:23, 8:58, Jn 1). And the Bible teaches that in Him dwells all the fullness of the Godhead, but bodily. But it is made clear that Jesus partook as much as any man in flesh and blood. This means that Jesus had a body that was fully human, flesh and blood as much as any normal human man. And the Bible says that Jesus Christ came in the flesh (2 Jn 1:7) and was a man (1 Tim 2:5). The doctrine that Jesus Christ was both fully God and fully man, is also called “Hypostatic Union”, and nothing here contradicts it. 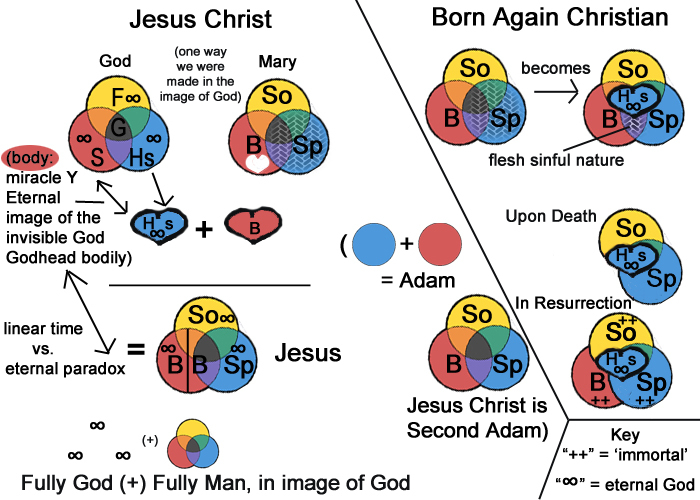 This theory agrees that Jesus was fully man and fully God. Just want to make that clear. Body’s life from spirit, “breath of God”, same thing as breathed into Adam, but given anew, second Adam. 1. The spirit of the father is solely multiplied to give life to the child’s body and make that child become a living soul. 2. The child’s body is multiplied from both the mother and father, and they become a living soul (mind, will, emotions). 3. The spiritual attributes or nature of the father’s spirit are carried in the multiplication of the spirit, passing to the child. Such as Adam’s sinfulness and spiritual death to mankind, or God’s sinlessness and eternal state to Jesus Christ (who was/is/will be eternal). Now if we simply understand what the Bible teaches about multiplication and paternal spiritual lineage, and just look at Gen 6:1-4, much becomes apparent as obvious. Sinful angels were the fathers of these children. These sinful angels were immortal spirits, and so their children would all be immortal spirits. They were sinful, so their children would also be sinful and evil. The souls of these children would be of the same spirit, giving life, as their immortal sinful angel fathers. It so happens that the bible says the “sons of God” type of angel is the same as the messenger type of angel, who when physically manifested, look like human men. It seems the bodily multiplication, combining human women with angels who looked like human men, produced children who the Bible calls men. Their spirits were like those of fallen angels, but their bodies were that of mortal human men. However, the Bible records their human bodies had noticeable abnormalities. 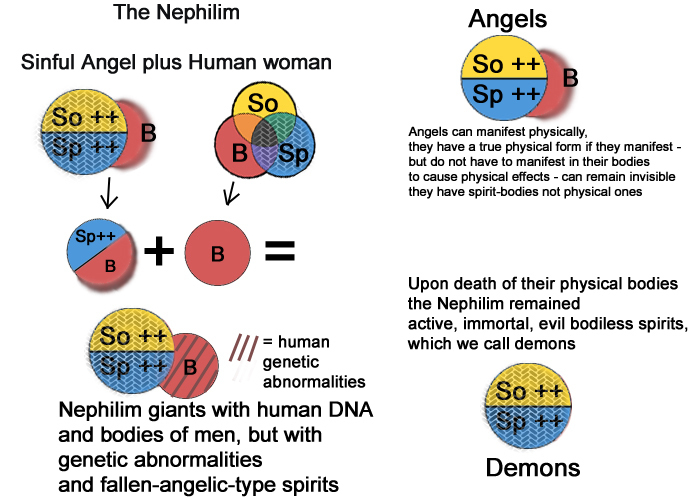 After these “nephilim”, who had bodies of men, died, what would become of their spirits? It makes sense just from what we know about multiplication, that their spirits would remain active, immortal and evil, even lacking a physical body, just like their fallen angel fathers were active, immortal and evil, despite being spirits not having a physical body. Just looking at the passage, knowing what the Bible says about multiplication, it becomes obvious that these giant men would have immortal evil spirits, that would stay active apart from having a physical body. 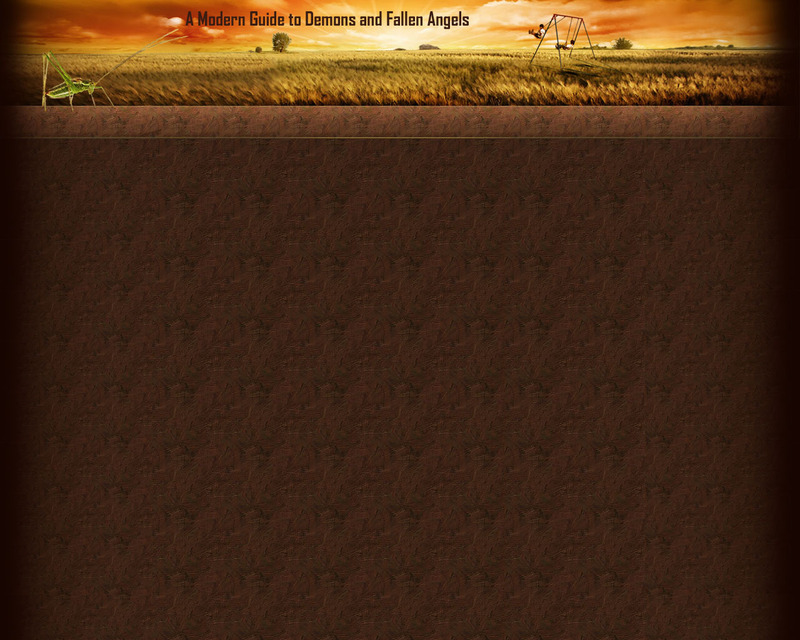 When we see demons later in the Bible, we can know this is their origin and when and how they came to be. So the Bible does in fact give all the information needed to derive the origin of demons solely from the holy scriptures. Understanding multiplication and paternal spiritual lineage, it becomes obvious just looking at Gen 6:1-4 that this is where the demons came from. No extra-biblical source is needed to explain where demons came from, the Bible is sufficient to explain this. Taking Paternal Spiritual lineage into account, and hearkening back to part 2 in this series, I said then that there was a mystery to be unearthed in the chronological break between Gen 1 and Gen 2. So let’s look at that again. 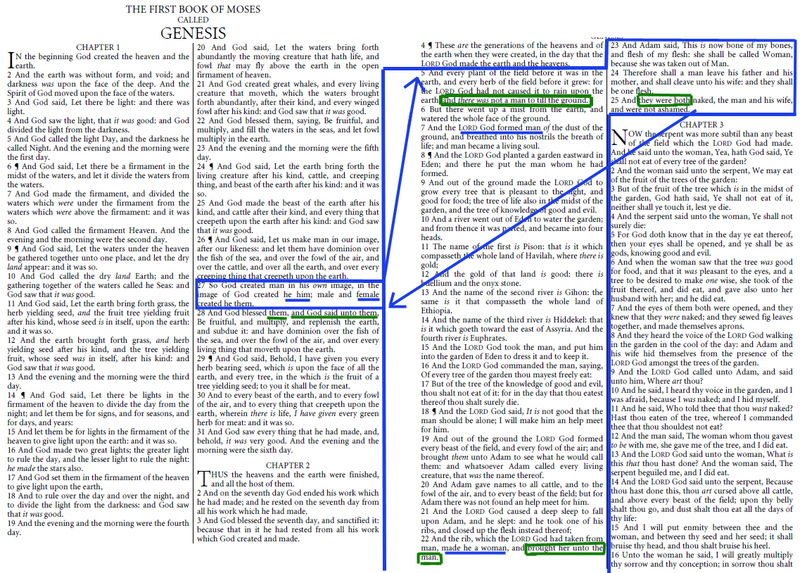 Let’s place Gen 1 and 2 in chronological order, taking into account that Gen 2 fits inside Gen 1:27. Then, let’s pay special attention to whether the word “you” is singular or plural in the Greek. 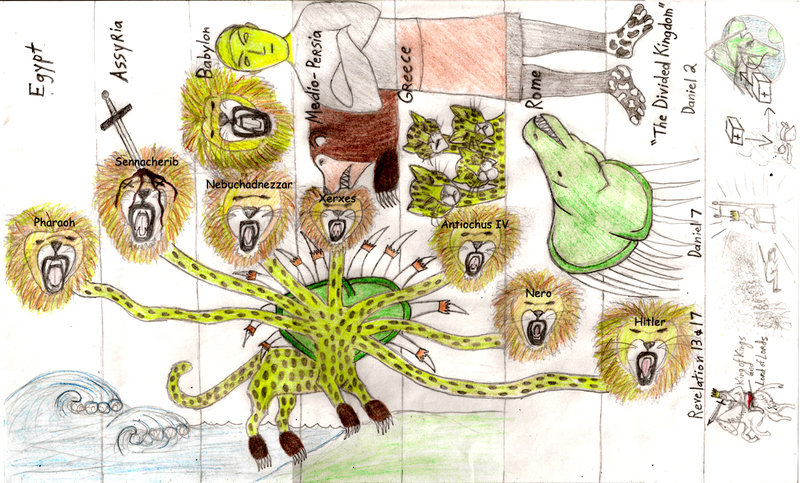 (Note that in the Hebrew all the “you” are all singular) And then God made Eve. 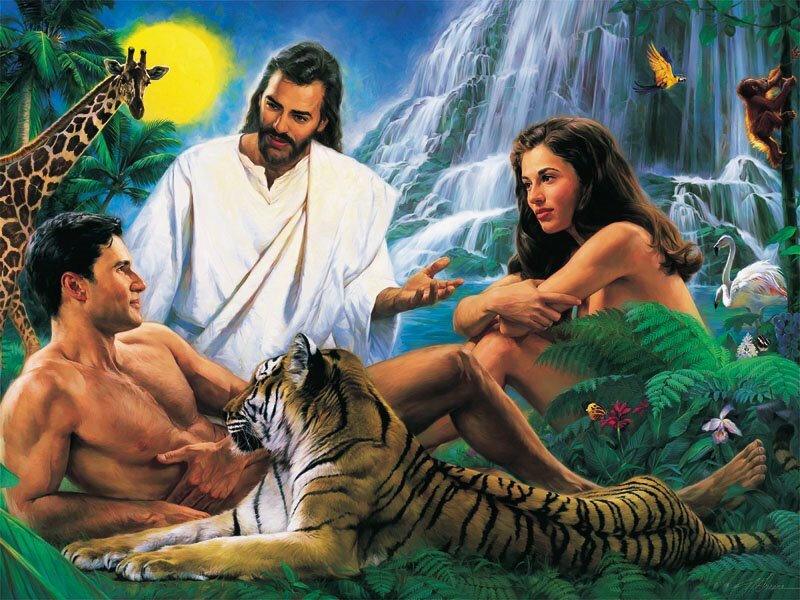 Here we see that God told the man he could freely eat of all the trees, but also commanded the man to not eat of the Tree of the Knowledge of Good and Evil, before the woman was made. God is not recorded as having given the woman the same command that God gave Adam. The woman was told by God that all the fruit-bearing trees had been given to them for food, without any exception mentioned in what God told her. It should be noted God told her directly that she had been given every fruit tree to eat from. From the woman’s perspective: God told her directly that she could eat from all the fruit trees, and she heard God tell the man he could eat from all the fruit trees, also, both of them being addressed together. But from the man’s perspective: God told him that he could eat from all the trees except for one. There was one tree he was commanded not to eat from, and if he did he would surely die. Then the man had God tell him and the woman, together, that they could eat from all the fruit trees. So de facto, the woman was told by God that she was allowed to eat from all the fruit trees, without any exception. Just let that sink in a second….. okay. However, Adam and God effectively had something hidden, a secret, between the two of them, which was that Adam was forbidden to eat from 1 fruit tree, the tree of the knowledge of good and evil, or Adam would die, specifically ”dying he would die”. As God’s command was not repeated, it seems clear that Adam told Eve about what God had said to him before she was made. If we assumed that God repeated this command to Eve, then we would be putting words in God’s mouth, adding to the Bible words that God is not recorded to have spoken. Such is dangerous. If God said it, then it would be recorded, and we must not add Words from God that He is not recorded to have said. Therefore, we can only conclude from God’s Word that we are meant to understand that Adam relayed information to the woman about what God had said before she was made. However, it is clear that this message was not relayed accurately, because skipping a little ahead, looking at singular/plural you’s, it becomes clear that God twice confirms later, after the fall, that His original command was only to Adam. God confirms twice that His command was given to Adam singularly, and was not given to them in the plural. 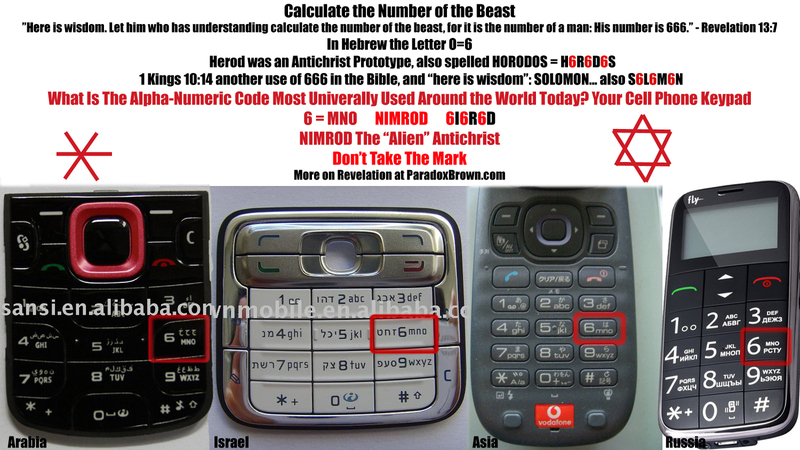 All three times are recorded in the Hebrew, for us to see this. All three times as it is recorded in the Bible, God gave the command to Adam alone, with a singular-tense “you”, and not the plural-tense “you” that would show God gave the command to both of them. It is also recorded that God directly told Eve that she could eat of all the trees, God told her this Himself. Adam was never charged by God to keep Eve from eating from the tree. God only commanded Adam to not eat, but God told Eve directly that she could eat from all the trees, and Adam knew this cause he was there. My conclusion is that Adam did not accurately tell Eve the Words of God. There was a miscommunication in what he told her, and beyond this, it seems intentional. But Adam probably didn’t understand he was doing anything wrong, as they were both like children. The most simple and logical explanation is that Adam told Eve that despite what God had told her directly, which was that she could eat from all the trees, that there was more that God had said only to him, before she was made. He told her that God had said that they could not eat of this 1 tree, or they would die – which was taking away from and adding to God’s words and was a lie. Now, I don’t know who added the “not touching it” part, the conversation is not recorded, but there’s probably more weight of proof that Adam added this addition, than that Eve did, because he clearly did change God’s words, so adding “don’t touch it” could easily be seen to go along with changing a singular “you” to a plural “you”. Evidence that this was intentional, can be seen in the Hebrew, as you(si) and you(pl) are spelled differently, and seem to be pronounced differently, which I would like you to see. Note: the woman’s eyes are not recorded to have opened until after the man ate the fruit, “then the eyes of both of them were open” and no time delay is mentioned between her and his eyes opening. The “you” here is plural. As such this “you” seems to be directed at the serpent and the woman. What did they do together? They tempted the man to eat from the tree. Note that the woman is not specifically told that she will die because of eating from the tree, but the man is told he will die because he ate from the tree. If the woman would die because of eating from the tree, what would make sense is that God would have told her she would die for eating from the tree in her punishments. But God does not say that. Instead the only reason given for her punishment is found in the statement directed to the serpent in the plural “you”. As this you is plural, it seems that God was addressing both the serpent and the woman. It would better read “because you two have done this“. What had the serpent and woman done together? They had tempted the man to eat from the tree. So the most straightforward reading of the text is that what God says to the woman as punishments or consequences are because of her participation with the serpent in tempting the man to eat from the tree that was forbidden to the man, as is specified twice. Then God forces the man, singular, to leave the garden, for the stated reason to prevent the man, just Adam, from eating of the tree of life. God specifies the man will return to the dust from which he was taken. It is not specified that the woman will die, only that the man will die. Without making any assumption, based just on what God says, it seems implied that if the man dies, then the woman will die also; it’s implied as a cause and effect. 2. Adam is told he (singular) will die because he ate. 3. Eve is never told she will die because she ate, and she was not commanded to not eat. Despite 2 opportunities to confirm she had been commanded not to eat also, God only says that He had singularly commanded the man to not eat, and God twice confirms this is the case. 4. Apparently God telling the man he (singular) will die implies the woman will die. The reason the woman died and her eyes did open was because Adam sinned in eating of the tree, and because his eyes were opened from eating. This affected a spiritual change in him, which in turn affected her, because her spirit was multiplied from his. This also would explain why the woman’s eyes were not recorded to have opened until after Adam ate of the tree. And this is why all of Adam’s children would sin, die, and would have their eyes opened – because their spirits would also be multiplied solely from Adam’s. If the woman alone had eaten of the tree, she would have been unchanged, and not died. And she could not have her eyes opened, a spiritual matter, unless Adam ate, because if she ate she would not know good from evil, from sinning in disobeying God, because it was not a sin for her to eat from the tree. But If Adam ate and his eyes were opened, then it would affect her also, because her spirit was multiplied from Adam’s spirit. This is why Adam was commanded to not eat of the tree, but the woman was given no such command, but told by God that it was fine for her to eat. Adam had the original spirit giving life, who all spirits were multiplied from. What he chose to do had power to effect the woman and all the children, real power, and so he carried the responsibility of not eating from the tree. Now, focusing in on the deception, the woman states that the serpent deceived her, not that he “lied” to her. This is also translated as “thoroughly deceived, tricked, or beguiled”. 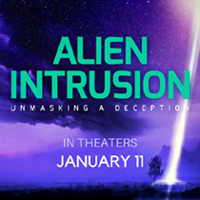 So what was the “deception”? A sort of double entendre, or a double meaning to Satan’s words. When the serpent said ‘you(pl) will not die’ Eve made the assumption that Adam had lied about everything he had said, made it all up, and that they both would not die, if either of them ate, as what the serpent told her implied such. This fit what she had heard God tell her directly, that they could both eat from all the fruit trees, so she defaulted back to that. However, the serpent was deceptive. The serpent said “you(pl) will not die”, but this response was only true if she alone ate. It had a double meaning. Serpent: “You both will not surely die. What is the “deception” here? In his answer to the woman, the serpent is negating her claim that if they both eat or touch, they will both die. Ie. “You BOTH will not die” What the serpent said could be taken 2 ways, one of which was true and the other which was false. The truth was that they both would not die if she ate or touched the fruit. But they both would die if Adam ate the fruit. What Eve understood by “you both will not die” was “if either of you eat, that individual will not die.” In fact, what the serpent said was that it was not true that they would both die if EITHER one of them ate, or touched it, implying if the one was her. The second meaning possible, which the serpent left out specifying, leaving it vague, was that they both would die if Adam ate, and neither one would die if she ate. And the serpent followed this with a simple statement, which was true in itself, that if they both ate of it that both their eyes would be open, like gods, knowing good and evil. In this combination of a double meaninged statement, the first sentence, plus a true statement, the second sentence, the serpent misled her, pointing her in the wrong direction. And that is how the serpent deceived her. Eve must have later understood that the serpent tricked her, as there was a double meaning to his words, his first sentence, and she had understood the wrong meaning. She thought he meant that neither would die if either one of them ate. We know this because she states that he “deceived” her. Not that he “lied” to her. The deception, in context, is that what the serpent said was partially true, and had a double meaning. And so this is how what the serpent said was a deception, not a just a blatant lie. What happened here was NOT that the serpent spoke a lie and the woman believed him. She was, in fact, thoroughly deceived, by the double-meaning of the words the serpent chose. And what set her up for this was that Adam had not told her God’s words correctly. If she had known Adam alone could not eat, this would have been in harmony with God directly telling her that they both could eat freely of the fruit trees. But because Adam lied to her, and it contradicted what she heard God say, she defaulted to thinking he had been lying entirely, made it all up, when the serpent deceived her. If Adam had told her correctly what God’s Words were that were said to him, then the serpent, Satan, would not have been able to deceive Eve, because there would have been no weak spot to attack. But as soon as she touched the fruit, which was allowed for her by God, and saw she did not die, she believed Adam had lied, and when she ate it and did not die, she knew Adam had lied, and thought it was safe, and then she thought Adam had made it all up, and the serpent was telling the truth, because it matched what God told her. She thought Adam was foolish, unwise, to have lied to her, and so thought he needed wisdom – so she gave him the fruit, believing it was safe for him to eat. Another question is did Adam understand what the serpent actually meant? Yes, as “Adam was not deceived” (1Tim2:14), it seems likely that he did understand. Adam understood that the serpent meant she would not die if she ate, but rather that just Adam would die if he ate. And so what would seem to be the likely reason Adam said and did nothing as the serpent deceived the woman? Because if he spoke up to contradict the serpent, he was going to have to admit that he lied to the woman. He could not contradict the serpent’s statement without getting caught in his own lie to the woman. This seems the most likely reason he said and did nothing. If it had been a misunderstanding, and she had misunderstood what Adam told her, then Adam could have spoken up to easily correct it. That Adam did not speak up is an important piece of evidence that Adam’s lie to the woman was intentional, and done knowingly, which he was fully aware of, and not a misunderstanding. Again “Adam was not deceived”. And rather than admit to lying, Adam decided to knowingly eat from a tree God had said would kill him, and as Adam was not deceived, he did this believing it would kill him, and he would die. He would rather have killed himself, than to admit to lying to the woman about what he told her. IF it was a simple misunderstanding, then why, not being deceived, knowingly kill himself? We can still see this trait in people today, that sometimes people would rather die or hurt themselves, than to admit that they lied, or made a mistake. I believe we call that pride. However, it seems very likely that Adam did not know that Eve also would die if he ate, but rather only thought that he would die if he ate. See man, like the woman, was never meant to carry the load of never eating from the tree – men may look a little more like Jesus Christ than women do, though both genders do look human like Jesus does (made in the image of God), but no other man is Jesus Christ, is God, and able to carry the burden, like only God can and does, of being sinless and perfect, forevermore, never eating from that tree, even if we do at times. A woman in quietness, you must have her learn in all subjection, to teach. But the woman I allow not never to be-one-who-with-her-own-hand-kills the man, but to be in quietness. For Adam was first formed, then Eve. And Adam was not deceived, but the woman being deceived became in the transgression. This says that a woman must learn first, before she teaches, in order to teach. In context, Paul is referencing to the sort of woman who is quiet and does her own work, sitting under a teacher, and learning the scriptures, before she teaches, ie learning God’s Word before teaching it. This was especially pertinent at the time because women needed to catch up to the men, many not having been taught the scriptures. Paul also makes the statement that he never ever allows a woman to become someone who “with her own hand kills another or herself” – but instead, to be in a quiet state of learning. Ie learning God’s true Word, before teaching another. This “not never allow” is a double negative negation in the Greek, and stresses emphasis here that Paul never allows this to happen. Paul illustrates the principle of learning God’s true Word, before teaching another, through referencing the story of Adam and Eve, which Paul understood. Namely that because of not being taught God’s true Words by Adam, that Eve was able to be deceived by the serpent, and that led to Adam sinning, and Eve becoming “in the transgression” ie taking part in the 1 transgression, sin, of Adam eating the fruit. Paul doesn’t blame Eve here, but rather emphasizes that he, Paul, never allows a woman to be put in that situation, because Paul teaches her God’s true Words – God’s Words – and cites what happened in Eden, and firmly sets himself as an example for Timothy, that Timothy must (imperative) have her learn, before she teaches. That’s what this passage actually says and means. This passage says nothing about women not being allowed to teach men, nothing about usurping men’s authority by teaching, etc. etc. It just says that women need to learn the scriptures before teaching, and places responsibility for this on the church leadership, which is easily applicable to both men and women, that either one must learn the scriptures before teaching them, but just women are emphasized here because they were behind in scriptural education, at the time. We are living in dark times of ignorance in the church, still, today. And it seems that the serpent still hates the woman, and is still persecuting her seed to this day, in doing everything he can to affect ignorance in the church, against women, among many other crimes against women in the world today. For a more thorough explanation, bible studies and analysis, on this and other topics related to gender in the Bible, see my book “Understanding Biblical Gender Equality” which is free to read online at WalkInTruth.net.